Last night might have been the second-best night in Vanderbilt baseball history, surpassed only by the evening nearly one year ago when they won their first national championship. On the fourth birthday of Grantland.com, a sporting internet website named for VU’s second baseball coach, the Commodores completed their super regional sweep of Illinois and secured a spot in the 2015 College World Series. Soon after the game ended, three Vandy starters– Dansby Swanson, Carson Fulmer, and Walker Buehler– were selected in the first round of the MLB amateur draft, with Swanson as the first overall pick. As they make their way to Omaha, here’s hoping this team has a few more good nights left in the tank. 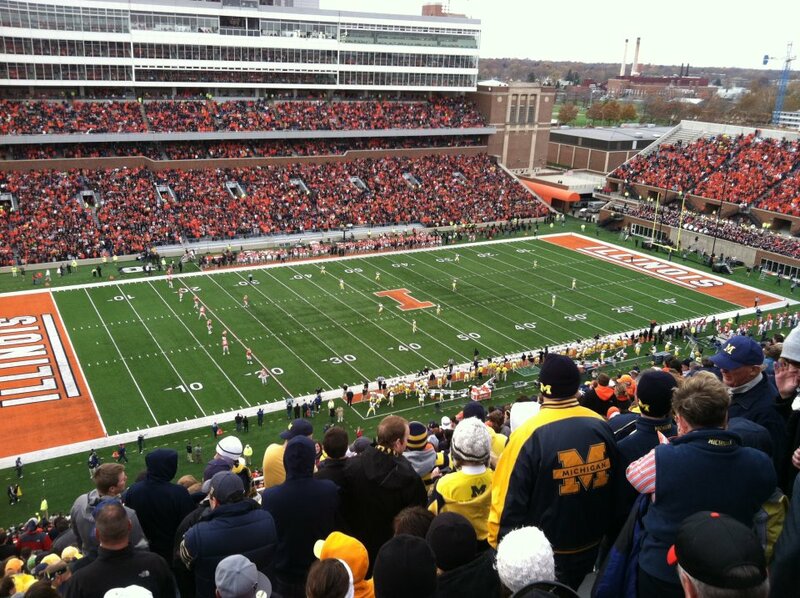 This weekend I had the opportunity to travel to Champaign to see the Michigan Wolverines take on the Illinois Fighting Illini. Those of you who know me are probably surprised that I even left the house this weekend, given that I had to save the world from both terrorists and dragons. But $65 tickets can’t be passed up, and luckily both the terrorists and dragons were there when I got back. I got into Champaign with my friend about two hours before game time. My suggestion to any ALDLAND readers contemplating attending a game at Illinois is to get there earlier, because finding parking can sometimes be tough. By the time we parked, there was maybe an hour and a half to get our tickets from will call and head into downtown Champaign for lunch at Giovanti’s before the game. If you hit up Giovanti’s, get the chicken tenders, which are pretty awesome. The curly fries are not to be missed either. Another reason to get to the game as early as possible is the tailgating scene. While we did not get a chance to tailgate, we did walk by various parking lots on our way to lunch, and from what I saw, I could tell that Illinois fans know how to tailgate. Most of the tailgates we passed by seemed to have ample food, drink and fun games to play like bean bag toss or that other game where you throw the little balls that are connected by a rope onto a ladder-like thing. You know what I’m talking about. After lunch, we walked back to Memorial Stadium, getting into our seats in the very last row of the upper deck just before kickoff. They were not the best seats for someone like me who is not thrilled with heights, but that’s what I get for ordering them a week before the game. Memorial Stadium is a nice venue, holding about 60,000 fans and offering an unobstructed view to every one of them (unless you are looking at the scoreboard, because from our seats some sort of tower-like structure partially blocked our view of the scoreboard).